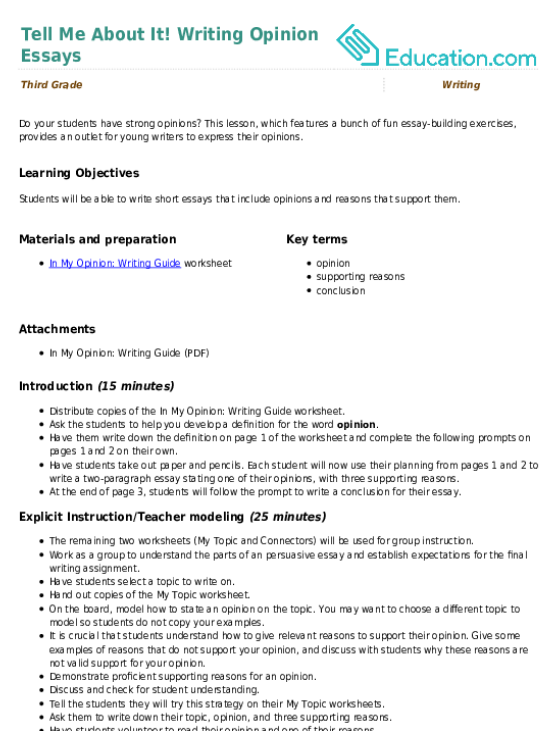 Students will be able to generate a list of topics for which they have an opinion, and with which they have experience. This will support them as they construct effective opinion pieces in their writing throughout the year. Tell your students a story about a time someone gave you a recommendation that didn't have tangible merit. For example: The other day, I was cleaning out my closet and I found an old board game that used to belong to my older brother. My friend, who was with me at the time, told me this board game isn’t any fun. I almost listened to him, but I ended up playing it with my parents anyway. We loved it! After I told my friend how enjoyable it was, I found out that he'd never even played the game himself. In fact, he doesn’t even own any board games! He was not an authority on the topic of board games, and I’m so glad he didn’t convince me to leave the game box unopened. Explain to your class that today, they will brainstorm a list of topics that they have knowledge of and care about. They will use this brainstorming list to write an opinion piece. Since they'll have knowledge of their topics, their audience will value their viewpoints. Display the Brainstorm Sheet to the class using an interactive whiteboard, document camera, or projector. Read the example in the first row aloud to the class. Explain this example so your students understand how this opinion is backed up by the writer's authority on the topic. Tell your students that by adding in information about their experience with a topic, they are establishing credibility, which will make their opinion writing stronger. Define CredibilityAs the quality of being believable or convincing. Input one more example of your own into the chart. Narrate your process as you go, so the class understands how to fill out the chart. Divide your students into pairs of two. Tell them that they will now see how this brainstorm activity can translate into an actual writing piece. 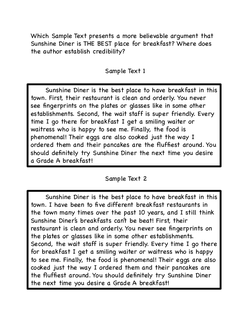 Pass out the Sample Text Sheet and have partners read both samples. Instruct students to identify which piece makes a more believable argument, and to highlight where the author establishes credibility in the stronger sample text. Once they've done this, go over their responses as a class. Pass out the Brainstorm Sheet to each student. 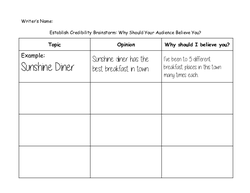 Ask students to create their own list of topics they have an opinion on and to push themselves to think about their experience with each topic. Enrichment:Provide extra copies of the Brainstorm Sheet to the students who have many ideas flowing. These students may also choose to begin composing an opinion piece, being sure to include the details from their Brainstorm Sheet. Support:Use guiding questions to help students who are struggling with this concept. Ask: What is your topic? How do you feel about your topic? Have you ever been there/tried that, etc.? What can you say to make sure your reader knows how much experience you have with your topic? Review each student’s Brainstorm Sheet. Look closely to see which students can establish credibility by stating their experience with their chosen topic. Have your students share their ideas with a partner or a group. Ask partners to give feedback: Would you believe your partner’s opinion based on his/her experience with the topic? Why or why not? Gather your students together and remind them that they can utilize this list whenever they are composing an opinion piece. It will help them ensure that they're writing about a topic on which they can claim to be an authority. 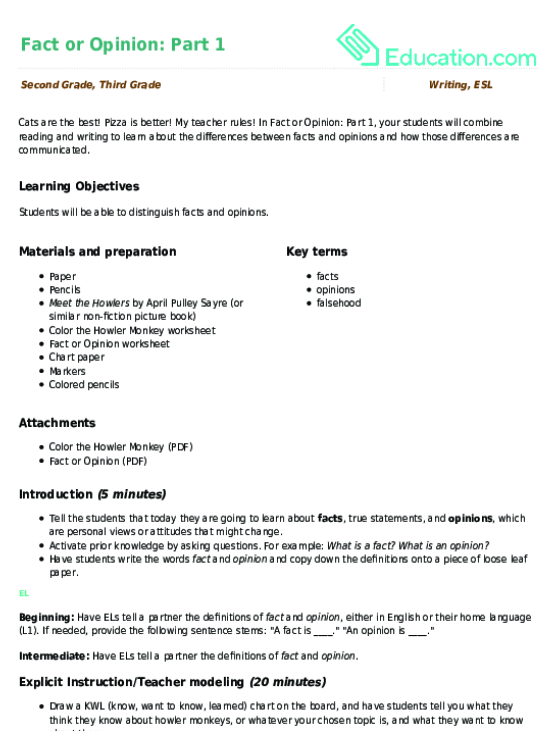 This lesson, which features a bunch of fun essay-building exercises, provides an outlet for young writers to express their opinions.